Ms. Nola Ochs at the age of 98 became the oldest person to receive a masters degree. Hailing from Kansas, USA, she earned a general studies degree with an emphasis in history, from Fort Hays University, graduating alongside her granddaughter, Alexandra Ochs, who was 21 years old at the time in 2010. 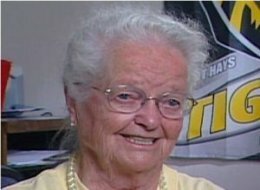 She also holds the record for being the oldest (at the age of 95) to get a Bachelors degree which she earned in 2007.